The storms that passed through the valley recently has Sacramento at 95 percent of average rainfall for this time of the year. As of Tuesday, February 5, much of the ABC10 viewing area is no longer in a drought. Thanks to recent rains in the Central Valley, the U. S. Drought Monitor has removed the abnormally dry status for much of the region. 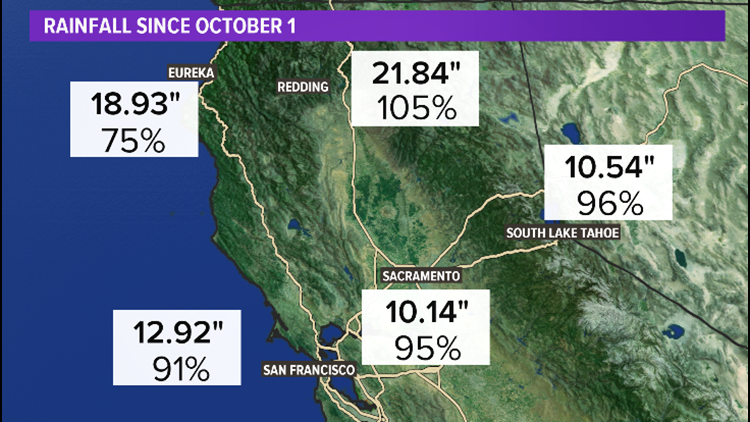 Here's a look at how much rainfall Sacramento Executive Airport has received since the start of the water year, October 1, 2018 - 10.14". Tap here to see the current weather conditions where you are. That puts Sacramento at 95 percent of average rainfall for this time of the year. South Lake Tahoe is also looking at some pretty good numbers, 10.54" which is 96 percent of average. As more rains approach the area this weekend, the continued and consistent precipitation should put the area in a pretty good position for the upcoming dry weather this summer. The couple tried to put tree branches under the wheels to get traction, but nothing worked. As it grew dark -- with little food, no water or cell service, and just the jackets they wore that day -- reality set in: They were trapped for the night.